WTF? 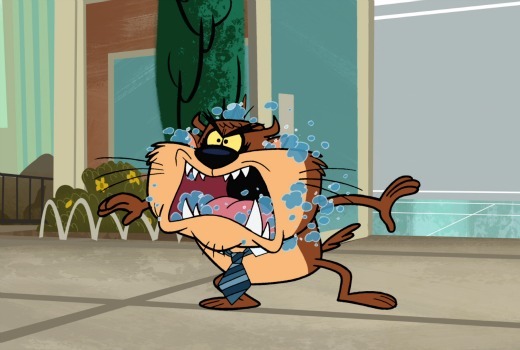 They’ve renamed Tasmanian Devil as Theodore Tasmanian? TV Tonight has the World Exclusive first image of the growling character, not due to appear on screen until May 2016. Thankfully he hasn’t been given a visual makeover too. Tasmanian Devil, affectionately known as Taz, first appeared in 1954’s cartoon Devil May Hare voiced by the legendary Mel Blanc. He nearly disappeared after being considered too violent for children, until Jack Warner recognised plenty of fan mail. In 1991 ‘Taz’ got his own show Taz-mania which ran for 4 seasons and introduced other family members including Jean Tazmanian Devil, Hugh Tazmanian Devil, and Molly Tazmanian Devil. Wabbit, which features the return of Bugs Bunny, is the first original series for the Turner Broadcasting kids’ channel since partnering with Warner Bros. in a new global venture announced in June. Each episode is comprised of four stand-alone, five-and-a-half-minute shorts, giving the unexpected, wacky feel of the original shorts. Weekdays on Boomerang from Monday November 2 at 5pm. What the hell are you talking bout? the only “australian” names are aboriginal names, all other “australian” names are european in origin. I would think there are a lot of names that would have an Aussie flavour. Davo, Jacko to name two. I wouldn’t think there are many Davo’s and Jacko’s in Europe. So there will be 4 shorts going 5.5 minutes long instead of the usual 3 going 6 or 7 minutes. To fit in more commercial time perhaps?